Rich Wilson was inspired to create this model was inspired by an actual vehicle that appeared on the cover of a "Motor Books" catalog. 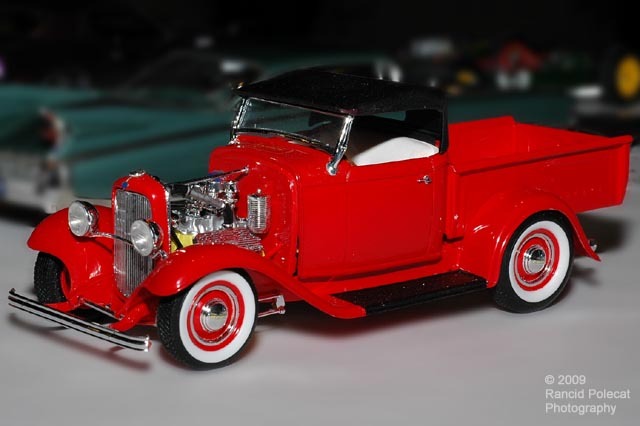 Rich's phantom cab comprises the cowl and doors of a Revell deuce roadster and the lower portion of an AMT/Lindberg 1934 pick up cab back wall. He capped off the custom-made cab with a chopped windshield frame and a modified AMT model A roadster soft top. For the interior, he modified a monogram 1932 Ford "Little Deuce" interior tub to fit.